The yellow variegated iris like all other irises got its name after the Greek goddess Iris - the messenger of love who doubles as the goddess of the rainbow. The irises come in different shapes and colors and the yellow variegated iris is just one of the many irises. This species is also named after its pale yellow flowers and the yellow flowers are especially used to symbolize passion. They are very pleasant and best sent to loved ones that are not well to wish them a quick recovery. 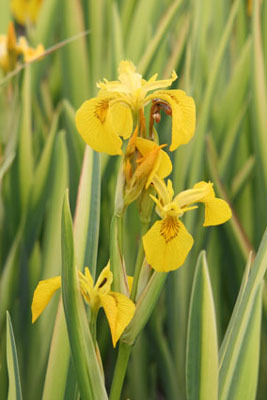 The Yellow Variegated Iris has a pleasant fragrant and is therefore very recommendable for water gardens and bogs. The flower has a variegated strap-like foliage that is green, yellow and pale green where the flowers are beautifully held. The Yellow Variegated Iris is suitable for use in containers. It is an herbaceous perennial plant like most other irises. This flower belongs to the Iridaceae family and the genus Iris. It grows up to 24 to 36 inches tall; and when planting the following spacing is recommended depending on the size and number of rhizomes,30 to 38 cm38 to 45 cm and 45 to 60 cm. The Yellow Variegated Iris does very well when exposed to the full sun. This is common to most other irises. Some parts of this plant are poisonous for ingestion so children should be discouraged from playing with the plant as they may ingest it and get poisoned in the process. Once this plant blooms it assumes a bright yellow color. The yellow variegated iris requires a lot of care during watering to prevent drying out. It also requires moist soil consistently. Some people use this plant for aesthetic purposes, medicinal purposes, for manufacturing perfumes and other cosmetics.